the pad Thai we ordered was actually bad, didn't know that could happen in Thailand.. they took it back and didn't charge for it at least though. western food may be good here, the shake was nice but i wouldn't recommend it for local dishes. 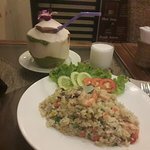 I ordered "Seafood Friedrice" and it was a HUGE PORTION ! !, Sorry for the left over food but i'm so full and it's sooooooo good !! 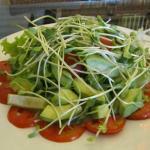 Avocado salad to die for! 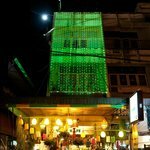 Arrived in Chiang Mai on alcohol free day! Avocado salad and stuffed cucumbers were amazing! 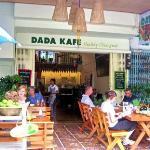 We dined at Dada Kafe our first night in Chiang Mai. 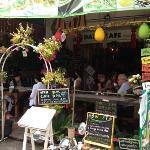 This wonderful restaurant proved to be a great introduction to Chiang Mai's bohemian chic foodie culture. 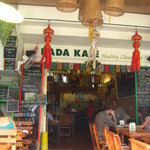 Dada Kafe offers pleasant indoor and outdoor dining areas. We chose to sit outside where lush foliage separates the outside patio from its neighbors, but you can still watch the busy street scene. It was cool and pleasant on the patio. We were impressed by the size of the menu with a great variety of choices offered. 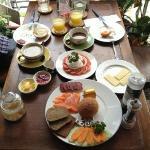 You could have breakfast, lunch, and dinner here for months, with something different every day! Like smoothies? They offer all kinds. Their breakfast menu looked appetizing, with lots of egg dishes, peanut butter and bananas on toast, and toast with avocado. But we were there for dinner. We enjoyed their fresh spring rolls, fried egg rolls, tantalizingly spicy papaya salad, Khao Soi noodles, green curry with tofu, tom yum, and sticky rice with mango. There were lots of vegan and veggie options for us to choose from. Everything was delicious. One member of our party was disappointed that her dish was not spicy enough for her taste, but we guessed that since this establishment appears to cater mostly to European and American tourists and expat digi-nomads, Dada Kafe tones down the spice levels. We really enjoyed our first meal in Chiang Mai at Dada, and it gave us a peek at the eclectic boho visitors who live and visit the Chiang Mai old city. 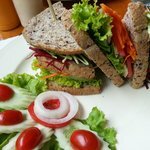 Healthy alternatives of western food! I came to Dada Kafe four years ago with a group of friends and we kept revisiting for the chicken burgers. Four years later, I thought it would be good to go again and the quality still remains the same! A great variety of shakes, id recommend any with peanut butter or a banana shake! This time around I had the veggie burger and it was great, a flavourful patty and lots of veg on the side as well as crammed inside the bun! 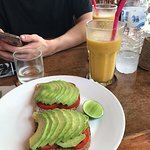 I also went back for breakfast and had avocado and tomato on toast, simple, reasonably priced and delicious! I’d recommend this to anyone who is wanting a change from the local food and wanting a healthier western option! 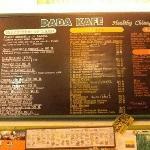 Been to Dada Kafe? Share your experiences!